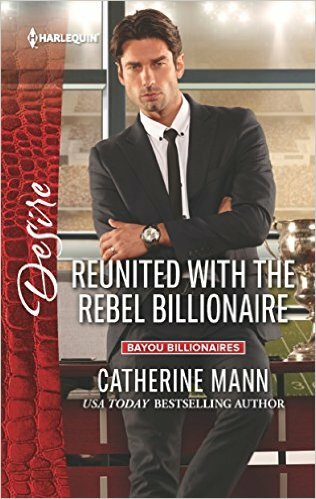 Reunited With the Rebel Billionaire is the third book in a series written by both Catherine Mann and Joanne Rock. The Bayou Billionaires series involves four brothers, so it would be recommended to read in order. The complete series is His Pregnant Princess Bride by Ms. Mann, His Secretary's Surprise Fiance by Ms. Rock, Reunited with the Rebel Billionaire by Ms. Mann and Secret Baby Scandal by Ms. Rock. Fiona Harper-Reynard was well aware that she and her husband had not married for love. There was affection, absolutely. Care and concern, always. Desire, without doubt. But not love. There had been a pregnancy, but like the others, no child had been the result. Now, her body and soul bore the scars of the truth of her situation. She would never have children. She had been at risk to the disease that had taken too many of the women in her life, and she had taken medical precautions to try to prevent that from happening to her. But nothing came with a guarantee. Neither those precautions, nor a marriage. And she knew it was time for theirs to come to an end. Henri Reynaud may not have married his wife for love, but he did not want their marriage to end. Now he realized that he had kept things at her pace, and abided to her wishes for too long. Learning that she wanted a divorce could not have come at a worse time for him professionally. As quarterback, he was a leader in their team, and this was the year that they had the best chance at going all the way for the title. But the fight for his marriage was the fight of his life, and he would use anything in his power to persuade Fiona that theirs was a marriage worth fighting for. Reunited With the Rebel Billionaire was a poignant reunion between two individuals who although they were still living together, finally find their happily ever after. Fiona had been hiding too much from Henri. Her feelings, her love, and certain medical issues. But what she really had been hiding was from herself. Her fears were valid emotions, but Henri is willing, able, and more than capable of being her partner in all ways. It was wonderful to see these two characters who we had seen previously, knowing that they were in pain, finally come together in the most perfect of marital unions.